I had a little of the Heather Bailey Pop Garden Zig Zag fabric leftover and I finally bought the Alexander Henry Lemon fabric from Joann’s that I drooled over during several visits. So I combined the two to make Iz a fun, funky, a line of her own. Lelia will get one too, but here’s will have a yellow and white chevron print to go with the Lemon print. Once again, I’m using the Carla C A-line Jumper Pattern for this dress. It has got to be one of the more simple dresses to sew, I’m fairly sure I knocked this one out in under an hour. The spring wardrobe is coming together for the girls! They’ve each got 2-3 dresses now and more coming down the pike! There are several more patterns that I’d like to try my hand at for spring, and then there are some one’s I’d like to kind of create on my own for the girls. Again, I have to say that this really is a nice creative outlet for me and it’s so satisfying to see a project through from start to finish. Plus I love that my girls have clothes to wear that were made with love. Today, I attempted a dress sans pattern and it actually turned out how I wanted it too! I used the top of the precious dress pattern and then took a dress that Lelia already had in her wardrobe from Old Navy to configure the bottom half of the dress. I cut out an aline front and back skirt piece and used what what leftover from the width of the fabric for the three layers of ruffles. I constructed it a little differently than I had the bustle part of their Christmas dresses. Instead of stitching the ruffle layers on right side to wrong side, I sewed them on with right sides facing, which meant the ruffles were upside down when I sewed them on. It provides for a cleaner finish. I also, for the first time, used the rolled hem feature of my serger to finish the edges of the ruffle layers. Since it’s unseasonably warm today, I got Lelia to model her dress outside in the sunshine and therefore got some abfab shots of her in it. She loves it! BTW, the fabric is Dena Designs London Blue. My resolution is to make as much of my wardrobe and my children’s wardrobe as I can in 2012. I started right after Christmas and have already completed a coat and jacket for myself and a little A-line jumper for Lelia. Part of this process will be documenting it here, and I have to say, that’s almost harder than making the items!! I had my husband take pictures of me in the coat and jacket yesterday and they didn’t turn out well at all. So I have to start anew and try again. It’s hard to take photos that make the items looks good! Any way here’s the latest attempt at the photography. This is the Carla C A Line Jumper with a fine whale corduroy I had left over from Halloween, and Michael Miller garden pindot fabric for the reverse. I made a long fleece coat for myself from Vogue V8775 using a fleece from Joann’s. I love it for when I’m wearing longer sweaters and skinny jeans or leggings! The most difficult piece of have made to date is the Sandlewood Jacket by Amy Butler. It had horizontal and vertical darts, is fully reversible, and has interfacing throughout. Not to mention the contoured two piece sleeves and the sheer size of the jacket! I am, however, IN LOVE With the final product! I used is Pernilla’s Journey by Tina Givens and I’m obsessed with it! The outside is Homestead Gardens in cotton candy and the Elephants on the inside, is called Elephant Run in Cotton Candy. I have a little of both left over and 3 whole yards of the Suzani in Lemon Creme that I’m dreaming up projects for. I think it might be good for a pair of flowy drawstring pants. With 8 grandparents and plenty of great aunts, uncles, and cousins, there’s lots of family for us to try and see on Christmas. Since we moved to our current home, two+ years ago, we have all the grandparents come to us and it makes for a fabulous day! It starts at 7am when my mother and step father arrive. And this year we had the pleasure of having my sister’s boyfriend join us as well! She sleeps here in Isabelle’s bed on Christmas eve. We opened presents, enjoyed a nice breakfast and then they went home to get ready for the rest of the day. We cleaned up, got food ready and rested for a bit before the next group arrived. From about 11:30 til 4:30 we hosted Colin’s mom, dad, step-dad, step-mom, and brother and my dad, step-mom and step- sister. The girls opened more presents than should be legally allowed and basked in the attention that was heaped upon them from every direction. Then we cleaned up, and headed out to Colin’s brothers house, my mom’s sister’s house and my dad’s sister’s house. Lelia passed out on the way to my mom’s sister’s and remained asleep as we carted her in and laid her on the couch, socialized, picked her back up, and drove to my other aunt’s, where she slept on her couch until we left at around 10pm. It took all of Monday and part of Tuesday for us all to recover from the festivities. It truly is my most favorite time of the year and I love every last second of Christmas day. However, come December 26th, the tree is too big, the lights too bright and the Christmas music is more than I can bear to hear. So today, I de-Christmasized our home and am enjoying the much less cluttered feeling that a lack of garlands dripping from every surface brings! Ready to ring in the new year and get to work on my resolution: To sew most of my girls wardrobe and to make a good portion of mine as well! Already completed 2 coats for me and a dress for Lelia! Christmas Dress aka I Made Puffy Sleeves! I’ve been sewing since home ec in middle school. When I was 12 or so, I spent the weekend with my grandmother (an avid seamstress and quilter) sewing a dress for myself from a pattern. In middle school and early high school, I would invite friends over to sew with me and we made nightgowns out of muslin. When I moved into a house in college, I sewed myself a quilt, stripes on one side and a starry moonlit sky on the other. After college I sewed trim to the bottom of jeans like it was going out of style, and in fact, it was going out of style. THANK GOD! I got my own machine for my 23rd birthday and promptly sewed myself 800 purses and jewelry pouches and the like. Then life took over and I put the sewing machine away. I got married, I moved, I paid someone to make curtains, I had babies and I moved again. I bought curtains from Target and forgot about my sewing skills. Pinterest came along and I got the crafting bug and I spray painted some stuff and thought about getting out my machine. One day my mom said she’s buy my girls American Girl Dolls, and my girls became obsessed with the idea of matching clothes. So I began scouring the internet for outfits that were nicer than the AGD ones and perhaps more affordable. I found them in the form of MakMay Designs, my trusty Christmas/Birthday/Halloween outfit designer. She’s super talented and equally creative. But then I wanted clothes for the girls and their dolls that was outside of what Becky creates and I stumbled upon a site that had tunic tops and dresses for girls and their dolls as well as Mom’s. The catch was that it would cost $60 to dress the girls $20 for the dolls and $80 for me. Way more money than I was willing to spend. And then it dawned on me! 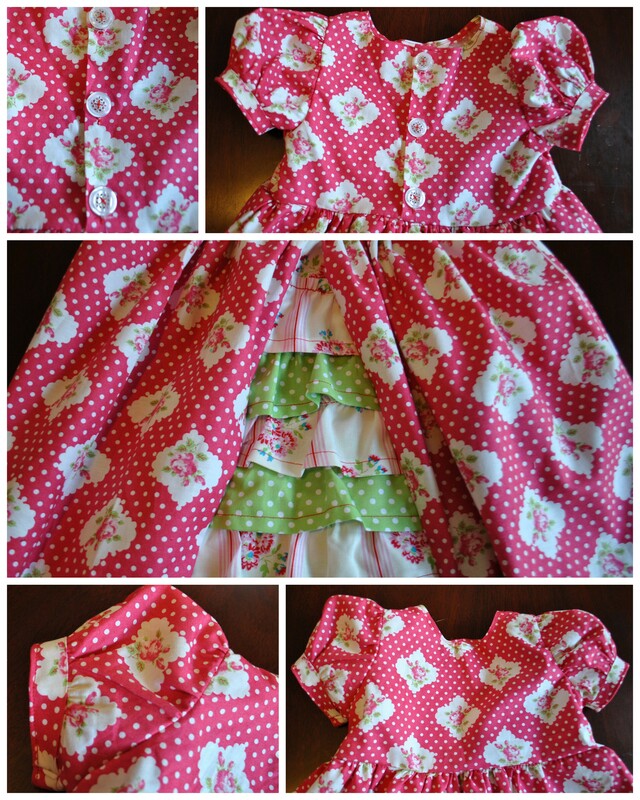 I could make these tunics and dresses myself! Thus begun my renewed interest in sewing. I went from an A-line dress, to PJ’s and then got bold and purchased the Precious Dress pattern from the Scientific Seamstress. I even contacted her to see if she could hold my hand through the process because it seemed a little daunting. And of course, not only did I want to make the dress, but I wanted to add my own little flair. She kindly agreed but before I had the chance to visit her, I decided to try it on my own, button holes and puffy sleeves and all. The pattern isn’t just a pattern, it’s also a full picture laden tutorial with detailed instructions! I started with the skirt, which is where I wanted to add the ruffled faux bustle. I cut out the pattern pieces and freehanded the bustle pieces. I constructed the whole skirt in one night and was super pleased with my efforts. Last night I set to work on the scary part…..the top with the button holes and puffy sleeves. I started by watching an automatic buttonholing video on Youtube, that happened to be on a machine similar to mine. Then I followed each incredibly well written, easy to understand step and before I knew it, I had a gorgeous top. Attaching the skirt to the top was easy and the finished product is better than I had pictured in my head! The only thing missing is a nice thick grosgrain ribbon sash! I relate this whole long winded story because I am so glad that I found sewing again and am finding such joy in spending quiet time piecing my patterns together. 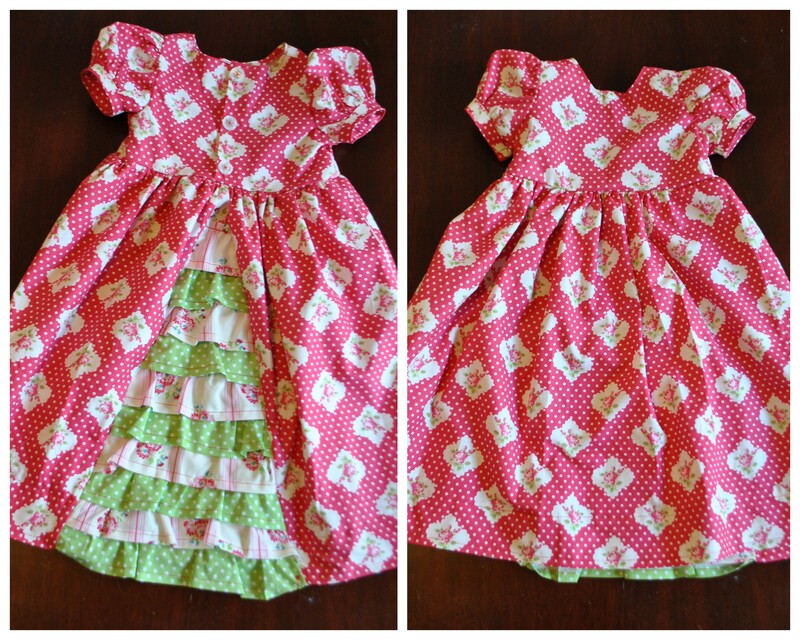 It is incredibly gratifying to know that I can do this and I am so happy to be able to give these dresses to my girls. Without further ado…THE CHRISTMAS DRESS! Puffy Sleeves and Buttons...yeah I did that! !